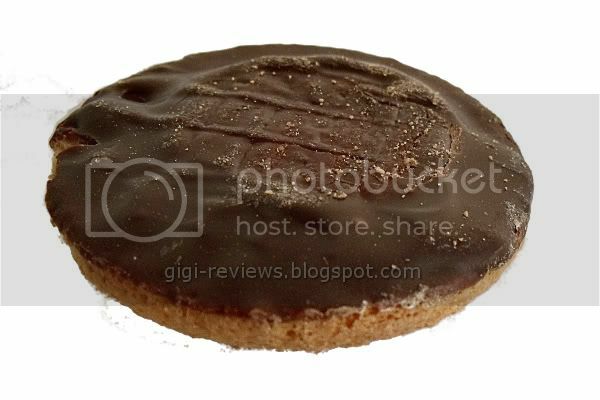 A Jaffa cake, should you not know, is a sponge cake base (sort of like a "black & white" cookie) topped with a jam-type fruit filling, and then the jam is covered with a layer of chocolate. According to the all-knowing Wikipedia entry, they were invented by the Scottish company McVitie's. 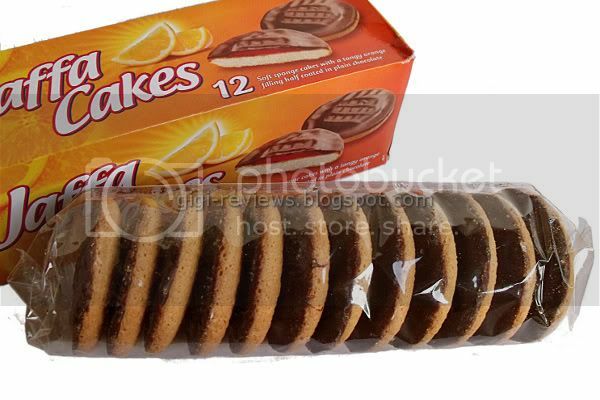 They were called Jaffa cakes because the first batch was made with orange filling, and they were named after a type of sweet orange that grows in Jaffa, Israel. My Jaffa cakes were made by Burton's, which has been making biscuits and sweets in the U.K. for so long that Queen Elizabeth (the second, not the first!) could have eaten them as after-school snacks. My cakes were the traditional orange-filled, and topped with what the box describes as "plain chocolate" -- which, from the looks and the ingredients, I am taking to be milk chocolate. 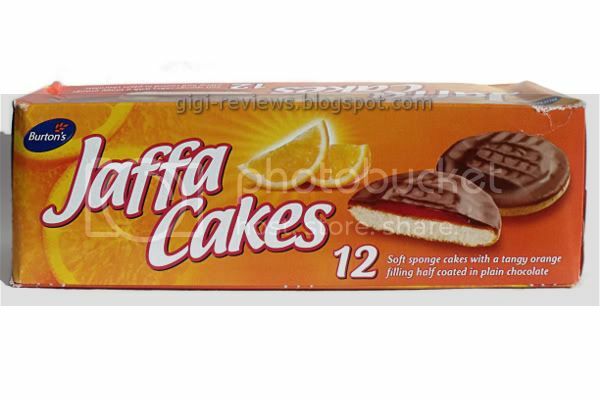 What I like about Jaffa cakes as rule is the springy softness of the sponge cake. My version was a bit on harder side. It was well within code, so am not sure if I simply got an "off" box, or whether this is the normal texture for this brand. Texture aside, the cake is pretty bland. It's not bad -- there's just not much flavor at all. As for the orange jelly: this was some seriously good filling! The texture was moist but not gooey. And at the same time, it was not as firm as, let's say, a jelly roll candy. It has a bittersweet quality, like a smooth marmalade rather than a sweeter orange. And that is a beautiful thing. If I could get this stuff in vats, I would smear it on everything. The chocolate: nothing special, it's just sort of a generic semi-sweet. It's not outstanding in any way, but it's not bad either. The melt is a little waxy, but it covers the cake nicely. Think of store brand chocolate chips and you've got it. This is hard to rate because I am not sure if the texture issues that I experienced were the results of a stale box, or if that is the "normal" texture for the Burton's version. Based on some random things I read online, I am apt to think that what I had was the "normal" version. But without another box, I don't know for sure. Labels: Burton's, Cakes, Chocolate, Fruit, Imported, Orange, Semi-Sweet Chocolate, Snack Cakes, Snacks, U.K. I haven't tried these ones, but I know some of LU's Pims very well. We get the orange, raspberry, cherry and apricot flavours here. I've never even heard of a pear one, but it sure sounds interesting. The cake in these ones sounds like it would have disappointed me as well. 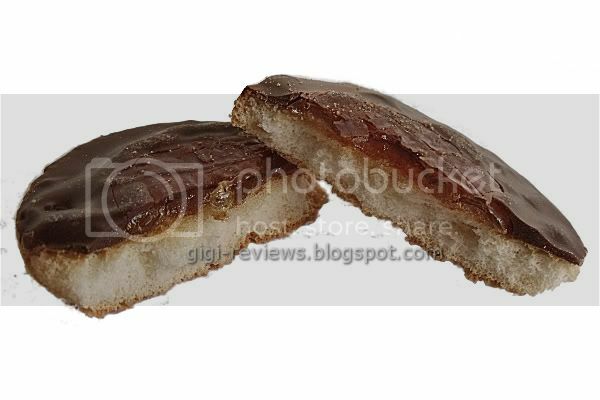 I usually like best those Jaffa Cakes which have a thinner, softer and moist cake layer and a thicker fruity layer. And, of course, covered with a nice, generous chocolate layer - in a lot of the ones I've tried the chocolate layer is ridiculously thin.